Acute respiratory distress syndrome (ARDS) is a life-threatening lung condition that prevents enough oxygen from getting to the lungs and into the blood. It is the failure of the pulmonary system to provide sufficient exchange of oxygen to supply the body’s demands. There are around 200,000 cases each year in the US alone, and unfortunately around half of all those who develop ARDS do not survive. There is a lot of great information on this topic available on ARDSNet, Medscape, PubMed, PubMedHealth, and Wikipedia – ARDS, and UpToDate – ARDS. Here is a great mind map resource for understanding ARDS. 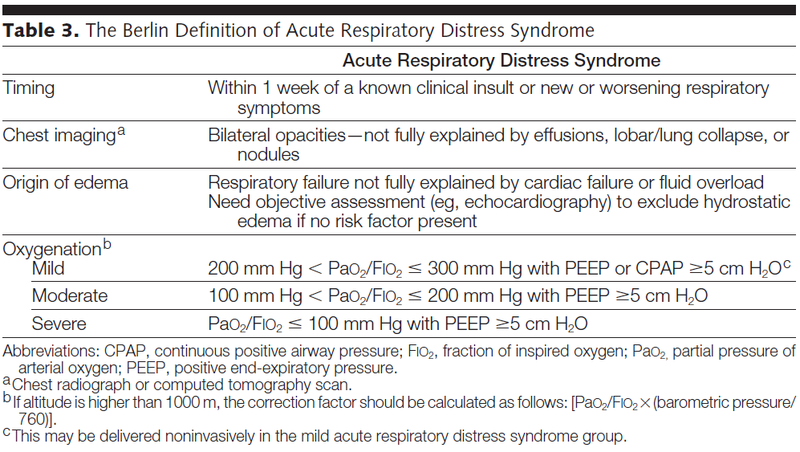 Additionally, I have a page on ARDS, where I have compiled a lot of this information into one source. Here are some of the key points to review. Does not affect LV function, and initially PAWP remains below 18. Challenge in ARDS patients is to adequately ventilate while preventing injury to lungs from the high pressures required to inflate noncompliant lungs. Research is ongoing; prevention of ventilator induced lung injury is a major focus currently. Inverse Inspiratory/Expiratory ratio: Normal ratio is that the inspiratory phase is < expiratory phase. IVR reverses this so that inspiration takes longer than expiration, protecting the lungs. Here is a great YouTube video synopsis. This entry was posted in Medical, Nursing and tagged ARDS, medical, nursing, Respiratory, Respiratory Failure, Respiratory Therapy on January 4, 2013 by rjjaramillo. What do all of those dials on the ventilator do? Well, Scott Weingart has a great two part series on Dominating the Ventilator that explains them, and how to use them to help your patient. I have posted his video podcasts below, along with some of his notes, but you can find the links to his original postings listed below as well. Part I, deals with the lung injury strategy. In part 2 below, he talks about the strategy for patients with obstructive lung disease. This is Part II, it deals with the obstructive strategy.Your goal with these patients is to let them have adequate time to breathe out. This entry was posted in Medical, Nursing and tagged ARDS, Asthma, Asthmatic, Chronic Pulmonary Obstructive Disease, COPD, Fi02, medical, nursing, PEEP, Pulmonology, Respiratory, Respiratory Failure, Respiratory Therapy, Vent, Ventilator, Ventilator Managment, Ventilators on October 30, 2012 by rjjaramillo.